We all need stories about kids who are resilient and brave no matter their circumstances. 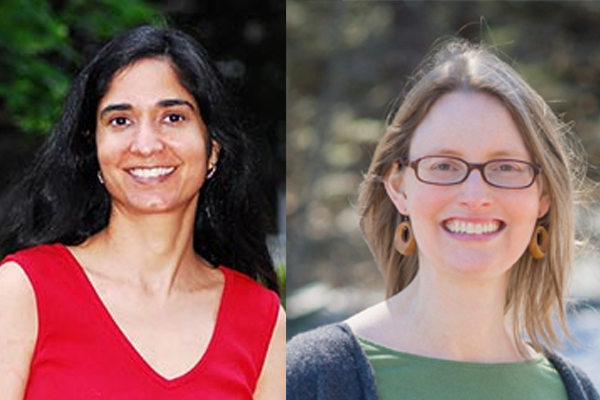 With their newest books, Padma Venkatraman and Ann Braden have written two of those stories. Join us for an event on Independent Bookstore Day with Padma and Ann as they talk about Padma’s book, THE BRIDGE HOME and Ann’s book THE BENEFITS OF BEING AN OCTOPUS, an NPR Best Book of 2018. Recommended for ages 8+. Life is harsh in Chennai’s teeming streets, so when runaway sisters Viji and Rukku arrive, their prospects look grim. Very quickly, eleven-year-old Viji discovers how vulnerable they are in this uncaring, dangerous world. Fortunately, the girls find shelter—and friendship—on an abandoned bridge. With two homeless boys, Muthi and Arul, the group forms a family of sorts. And while making a living scavenging the city’s trash heaps is the pits, the kids find plenty to laugh about and take pride in too. After all, they are now the bosses of themselves and no longer dependent on untrustworthy adults. But when illness strikes, Viji must decide whether to risk seeking help from strangers or to keep holding on to their fragile, hard-fought freedom. This relatable look at life in poverty for a kid today—and how hard it is to break out of the cycle—is perfect for fans of Joan Bauer and Cynthia Voigt. Ann Braden writes books about kids struggling to find their voice amidst the realities of life. She founded GunSenseVT, a grassroots group focused on championing the common ground on the issue of guns in Vermont, which recently helped pass landmark gun violence prevention legislation. She also founded the Local Love Brigade, which now has chapters all over the country sending love postcards to those who are facing hate. Ann is the co-host of the children's book podcast, "Lifelines: Books that Bridge the Divide," along with Pakistani American author Saadia Faruqi, and is a former middle school teacher. She lives in southern Vermont with her husband, two children, and two insatiable cats named Boomer and Justice. Visit her online at www.annbradenbooks.com.